John and I have been watching Heroes recently. Its on NBC in America at the moment, so most of you law abiding people won't have seen it yet. Its pretty good really, apart from the incredibly irritating voice over at the start. If anyone from NBC is reading, get rid of it please. Anyhow, we've been waching for about seven weeks, and one of the characters, Nathan Patrelli, has really reminded me of someone, but I couldn't figure out who. On Tuesday it dawned on me - he reminded me of Bert from Sesame Street. I think you'll find the resemblance is uncanny. I expect Heroes will be on Channel Five next year, so you can judge for yourself, but remember you read it here first. On Wednesday I had made plans to go to the Well with Steve to watch the Arsenal match. We didn't quite make it since at about 7.30 he left a message on my phone saying he was at Warwick A&E with a sore foot. Being the kind and thoughtful neighbour that I am, I thought I'd pop over to the hospital, see how he was doing, point and laugh, go to Tesco to get a bit of food in before returning to the hospital and driving him home if needed. Luckily, I've never had the need to go to Warwick Hospital before, and the first thing I noticed was that you had to pay to park! At a hospital! What kind of money sucking vampires are they? Still, up to 15 minutes was free, so I assumed all I'd have to do would be nip in, ask for Mr Wharton, show concern, point and laugh and be away and shopping in 6 minutes, 8 max. Oh no, first they couldn't find him, then they sent me to the Children's Ward, then they told me he 'might have left' then they found him. 35 minutes! Anyhow, Johno had turned up and shown some concern for a few minutes before pointing and laughing and then there was some discussion over cars, keys and bags. 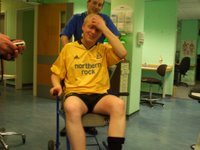 It turned out Steve had broken his ankle, and so Johno drove Steve's car home while I waited around while the (male) nurse plastered him up and gave him some crutches. Once hoppy Steve was allowed to leave I paid to get the car out of the car park - £3! - and somehow got back to Canal House before Johno, even though we left about an hour later. After the football, I decided I was hungry. I checked the cupboards and found them bare. I then made plans to go to Somerfield, but it turned out it shut early because of Bank Holiday Monday. Whats a person to do? Well, one answer is to go to Pizza Express, kindly accompanied by the next door neighbour, little Stefan. After a quick shower/change, Steve buzzed me at 7pm on the dot and we decided to go to the Lounge for an aperatif or cocktail or some such. The Lounge was shut, so we ended up in Satchwells drinking Tyskie beer on empty tummies. We then strolled down the Parade to Pizza Express where we stuffed our faces with doughballs, pizza, chocolate cake and wine and then moved on to the Jug where we drank more wine and discussed something to do with Easter, Jesus, the Third Testament and Steve suggested people should worship him. Right. I was feeling a little queasy at this point, which I think was due to the cake, not the wine, and so I suggested it was probably time to call it a night. On Monday morning, John and I set off from Wales at the crack of dawn (ish) to make sure he was in good time for his flight to go on holiday a very important business trip to Washington. Since John was swanning off, I made arrangements to go and watch Leamington play Westfields with Neighbour Steve. It was a very entertaining game which had something for everyone, including two excellent goals by Leamington, and high comedy own goal, a saved penalty by the Leamington keeper and the Westfields defence arguing a lot - and I mean a lot. At one point I thought they were going to have a punch up Newcastle United style. All in all, a fair result, although I was a little scared when it was 2-0 at half time and the North Bank sang "We're gonna lose 3-2". Luckily that didn't happen (this time) and the song became "5-3 on aggregate" at the end of the match. Saturday afternoon brought a Leamington Home game against Oldbury. Steve kindly drove us up to the New Windmill Ground in the Brakes Bus 2, and even got to park right by the exit in a 'small car' space. I seemed to be the only person with any faith in the team, with a 4-0 win prediction - John and Steve both predicted draws. After John and Steve had loaded themselves up with food/stodge from the burger van we arranged ourselves in the traditional viewing position and hoped there wouldn't be a similar fiasco to last week. Luckily there wasn't. Alex Rodman scored after a couple of minutes, and Stuart Herlihy made it two a little later. There were no goals in the second half, but there was entertainment, with Neil Stacey and some Oldbury player being sent off for having a punch up and then the Oldbury manager/coach person being sent off for being mouthy. He then sensibly went and stood right in front of the Harbury Lane end where he got entertaining abuse from the Leamington supporters for the rest of the game. All in all a good game, although John and Steve still want Cadzy sacked because it rained and Steve's pie was a bit cold. Some people - never happy. The ref was actually quite good this week, and Steve was intending to go and congratulate him, but it was raining so he didn't. After not drinking alcohol for six days, Friday came around and the decision was taken to go to the home of the Sugary God - Ruby Chinese on Park Street - and to have a 'chilled out not drinking too much Happy Friday'. We were delayed a while as John had got sidetracked in the Wheatsheaf, but once he returned home we headed out and were feeding our faces in no time. After our feast we strolled to Wildes, decided it was too crowded and there were not enough foxy ladies for Steve to drool over and so wandered back to the Jug where we did the usual drinking of beer for John and White Wine for me and Steve. John only lasted one pint before being sleepy and having to go home, but me and Steve stayed out for a little more wine and for him to take dodgy photos of a student girl's jeans and turn bright red again. I was very well behaved, didn't drink too much and even managed to walk home in a straight line without being sick. Yay me! On Saturday night, John, Steve, Paul, Gaz, MC and myself wandered up to Tom and Abbi's house to enjoy their hospitality and alcohol as it was Tom's 29th birthday. We met JV and Suzanne in the Star and Garter on the way, and stopped off once more in the Coventry Arms (where I've never been before) for another swift drink and a look at a scary dog, and we arrived at the party at around 10ish. The most amazing thing of the evening (apart from me getting hammered on two gins and half a glass of wine) was that Steve was actually nice to me! Whatever next? I think that's his quota met for the next two years, so I'd better prepare myself for the usual meanness and slapping for the foreseeable future. *Sorry Tom and Abbi for being sick on your wall. Sorry Tom and Abbi's neighbours for being sick in your garden. Sorry Steve for not stealing the bricks. **Thank you John and Steve for getting me home and cheering me up. Last night was St Patrick's night. It was also Friday which meant it was Happy Friday. In the great Happy Friday tradition, John, Steve, Gary and myself went for a curry and then drinking. This week's curry house of choice was the new one on High Street who's name escapes me. The food was very nice, but if you go be warned: they don't serve alcohol. They are happy for you to go to Costcutter and buy beer though, so its all OK. While eating we discussed the finer points of Wonderwoman, straightjackets and housebuying. After our food, Paul and Rich joined us and we went to the Pig and Fiddle. It was very crowded for some reason, can't imagine why. We then went on to the Bowling Green (hip and street) and then to the Jug via the Townhouse, where Rich left us. In the Jug, Steve got a kiss off a barmaid (the Lynx effect) who stole his guinness hat, and was unable to speak for the next two hours. It was lovely and peaceful. He also went scarily bright red and very hot. At about 12.30 we called it a day. Well, we were forced to since the Jug threw us out, and went home neatly avoiding a big fight which appeared to be taking place at the juction of High Street and Clements Street. I wanted to watch but I was just too cold and drunk. Yesterday, I was at work, thinking how much better things would be if I had a cold soft drink, so I wandered to the canteen and bought what I thought was a bottle of Pepsi Max. I returned to my desk, opened the bottle and had a drink. My first thoughts were "That tastes a bit weird", before I looked at the bottle and realised I'd accidentally bought a bottle of Pepsi Max Cino (or Coffee Pepsi Max to you or me). Now, I don't like coffee, but luckily this didn't taste of coffee (it didn't taste of coke either). It tasted more like chocolate or vanilla. I alternated by thinking "mmmmm" and feeling sick, but I had another bottle today and now its kinda growing on me. I was perusing my blog today, to find out details of types of Coke in America (for one reason or another), and I was shocked to see that I haven't blogged since January. Even worse than that, I haven't blogged regularly since July 2005! Right, that's it, I'm now going to blog regularly, even if its only about pointless things like new pepsi flavours.